We believe that our music inspires, transforms, and connects us to each other and our world. 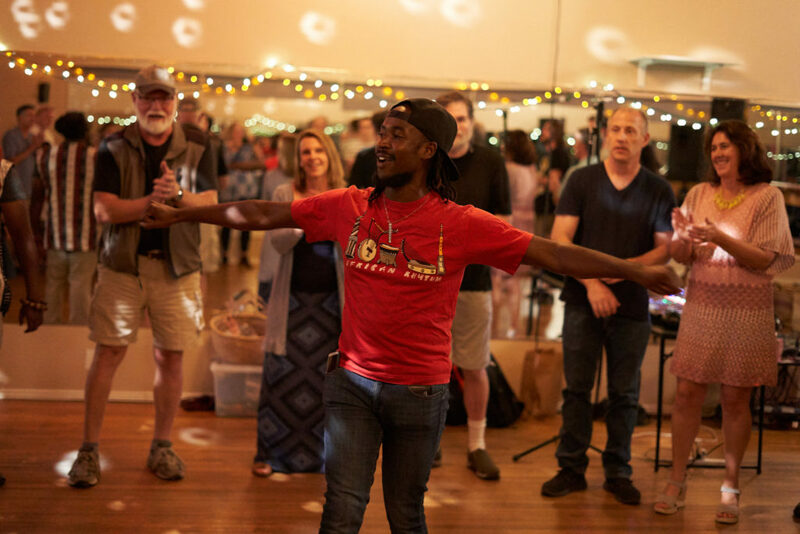 Our mission is to provide opportunities for people of all ages to experience the joy and connectedness of African music; we are helping heal the world by building community through music and connection. Students jumping for joy in Zimbabwe. Photo Credit: Julia Nelson. Playing mbira with friends in Zimbabwe. Photo Credit: Julia Nelson. Our teacher Taffie Matiure leads us in song at Alchemy of Movement in 2018. 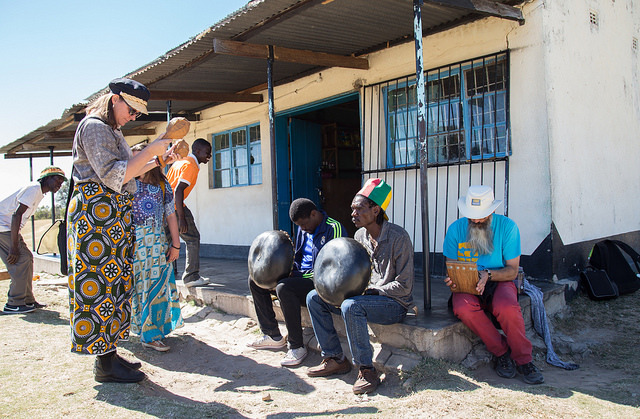 In the late 1950’s, three musicologists set out to recover and preserve the traditional music of the people living in the area now known as Zimbabwe, which was being lost to modernization. After research and cultural inquiry, they landed on the marimba as the instrument of choice to transmit, revitalize, and teach this traditional music. The Zimbabwean marimba was developed, based on keyboard instruments from surrounding regions but not affiliated with any one tribe in Zimbabwe. The Zimbabwean marimba was deemed the new national instrument of Zimbabwe and Kwanongoma College, a teacher training college, was formed in Bulawayo. The marimba was introduced into the schools across the country in the early 1960s as a way for young people to learn about their rich cultural and musical heritage. 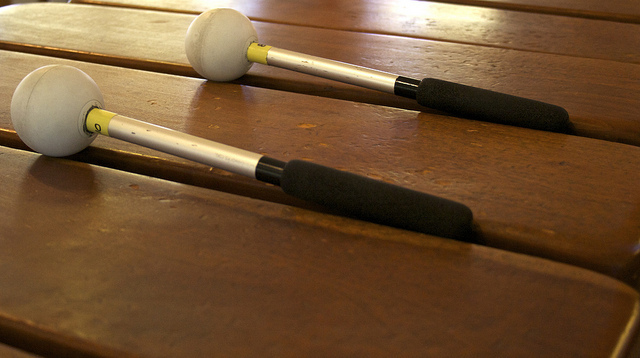 Much as the recorder is the universal instrument for American 3rd graders, the marimba has become ubiquitous in Zimbabwean schools. The Zimbabwean marimba and its accompanying repertoire came to the state of Washington with Dumisani Maraire, a then visiting professor at Evergreen College and the University of Washington. The music took off like wildfire and over the ensuing decades has spread across the US. The Co-Founders of the Moon & Stars Foundation became interested in the bringing of Zimbabwean marimba music and education to the United States in 1999. Now, many years later and through the formation of Moon & Stars Foundation, the Co-Founders along with the Board of Directors seek to provide a vehicle for multicultural music experiences for youth and adults, allowing participants to deepen their understanding of themselves, their communities, and other cultures through music lessons, classes, workshops, demonstrations, and concerts.